Move material efficiently with Hapman drag conveyors and the industry’s most durable chain. 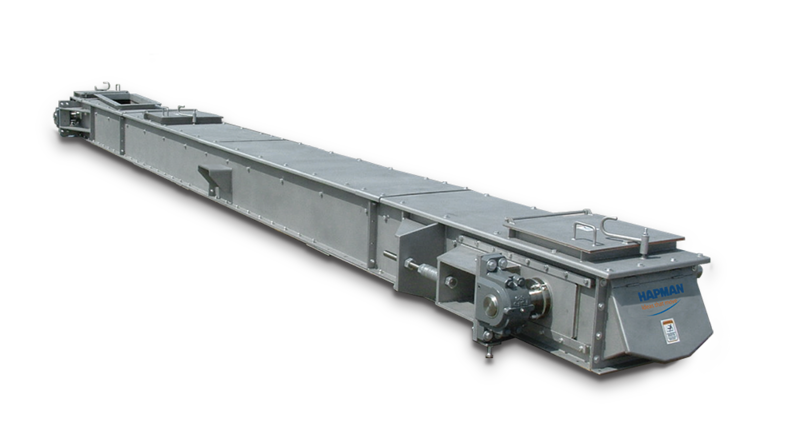 Hapman drag conveyors move material over distances ranging from 20 to 200 feet or more. These conveying systems are equipped with the industry’s most durable chain, built with an exclusive drop-forged, case-hardened formula that produces a hard exterior coupled with a softer, malleable core. This combination gives our conveyor chain the highest level of abrasion resistance while reducing the risk of stress and breakage. 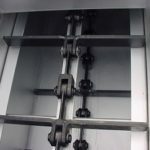 What Makes Our Conveyor Chain the Most Durable in the Industry? Core hardness is set at 300-400 BHN for strength and ductility. 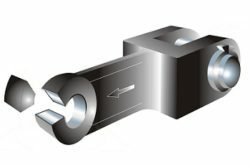 Machined yokes provide a tight,controlled fit between links. Each link is individually pinned for ease of replacement. Chain links are totally carburized to provide an effective case hardness of 550-650 BHN (60Rc) at a depth of 0.03″ to 0.04″. 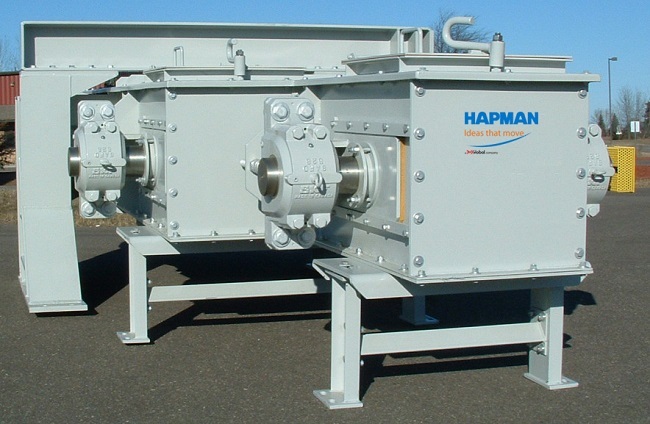 Hapman Drag Conveyors are engineered with the specific features required for each individual application. 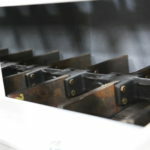 Conveyor size, flight selection, single- or dual-chain layout, housing, diverting discharge ports, high-temperature components, and other key options will be evaluated by our design team and included as necessary to effectively move all of your material. 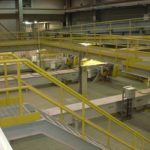 Conveying with En-Masse Drag Conveyors gives you the ability to move large volumes of material in virtually any direction or layout. The flexibility in engineered design means we can provide the optimum conveyor layout to achieve all of your bulk material handling and operating goals. The above image shows the tail end of a twin En-Masse Drag Conveyor. This type of conveyor is recommended when chain pull or capacity requirements too great for a single chain. 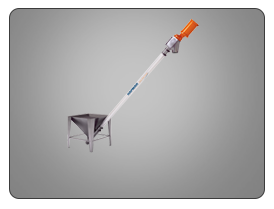 The twin conveyor requires less space than running multiple separate conveyors. The off-set, dual shaft design is our engineered solution for providing the longest, most reliable operation in the industry. The off-setting shafts allow for individual chain movement and take-up, maintaining optimum flow and capacity in your bulk material handling application. Size to capacity ratio – A typical belt conveyor uses 20-25% of available conveying space to move bulk material. 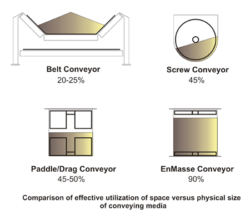 A typical drag or paddle conveyor uses 45-50% of available conveying space. 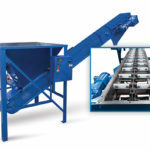 En-Masse Drag Conveyors use 90% of the available conveying space to effectively move material. 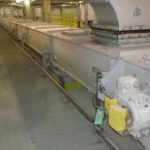 As a result, the overall size of En-Masse Drag Conveyors is greatly reduced when compared to other conveying systems and technologies moving the same volume. Ability to handle product in many conveyor configurations – Horizontal, inclined, vertical, L-path, Z-path, and looping are all possible with En-Masse Drag Conveyors. Ability to convey over long distances – En-Masse Drag Conveyors can effectively move material an average of 200 feet (61 meters) or more. Engineered for a wide range of bulk material handling – From Ash to Zinc, the design of En-Masse Drag Conveyors allows for large volumes of material to be moved efficiently and effectively. 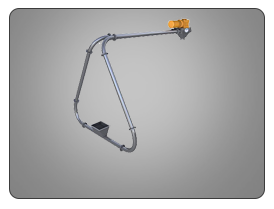 The Chain and Flight Design are the Keys to the Success of our Drag Conveyors. The internal chain is the workhorse of our En-Masse Drag Conveyors. Knowing more about their design characteristics will help you to understand why our chain and flights deliver unmatched durability, reliability and longevity. Impact and Wear Resistance – The chain in our Drag Conveyors is case-hardened with a strong ductile core. This engineered balance between exterior hardness and a malleable interior provides the right wear resistance without becoming brittle. Fatigue – Our chain design proportions the steel where needed and features dropped-forged steel alloy links constructed to avoid premature wear. Bearing Surfaces and Finish – Our bearing and surface finish process significantly limits joint articulation wear with precision machining and tight tolerances. 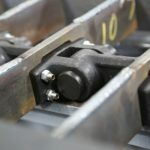 Manufacturing Techniques – We maintain strict dimensional tolerances and documented quality control procedures. We select the proper alloys for the application and have a proven system in place to verify production according to established standards. Flight Attachment Method – Our flight assemblies are welded and bolted for superior durability, even in severe conditions. Chain Weight and Pitch – We develop, design, and engineer our chains specifically for En-Masse drag conveying operations in order to achieve the appropriate strength-to-weight ratio for maximum longevity. 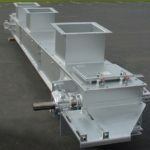 These flight options represent the most common designs for Drag Conveyors. Other styles are available. The T- and BT-style flights are used for horizontal through slight incline applications, normally between 0° and 12°. The U-style can be used for horizontal/incline combinations through approximately 25°. 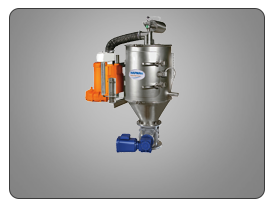 The modified BT, O, OO, and OO with filler plates are utilized in horizontal/inclined applications through 90°. We engineered a Single Strand Top Carry Drag Chain Conveyor to provide an automated solution to an aluminum foundry’s transfer process. This conveyor features abrasion-resistant construction and a design that requires minimal maintenance. Automating the foundry sand transfer process significantly reduced ergonomic risk factors and diminished the daily physical strain on mold makers, resulting in lower disability insurance costs and reduced claims as well as 20% increased production capacity. This Hapman En-Masse Conveyor operates 24/7 and moves Salt Cake at a rate of 10,000 lbs/hr to a liquor tank at a 10-degree incline. The installation temperature is approximately 400°F. Construction of the conveyor is 3/8″ abrasion-resistant (A.R.) sidewalls and 1/2″ A.R. bottom plates. The drive station is fabricated of stainless steel to prevent corrosion due to caustic steam produced by the liquor tank. This is our 19″ 142STD BT2 single-strand, drop-forged chain with 1/2″ x 2″ BT flights every other pitch. A chain speed of 15 FPM produces excellent chain wear and longevity, even in corrosive environments. 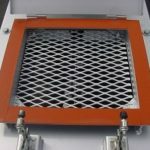 The inspection door is comprised of high-temperature silicone gasketing and a removable expanded metal safety screen. This Hapman En-Masse Conveyor handles Potash at a capacity of 800TPH. 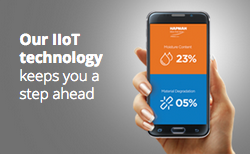 This system has an operating product temperature of 200°C. 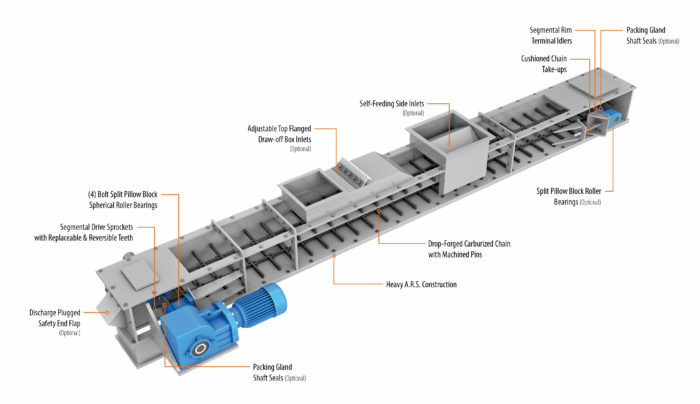 The complete conveyor system is located in the Potash processing facility.